I haven’t heard anyone pick apart any of underlying data yet, so I’ll assume that its correct. For my purposes today any errata in the graph itself isn’t a concern, just its visual presentation. 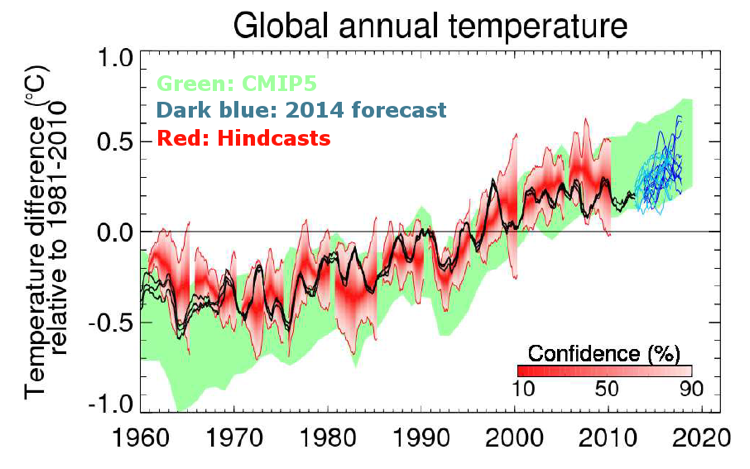 The black lines in the MET-Office’s Figure 3, my Figure 1, represent instrumental readings of actual global surface temperatures past [hadCRUT4, GISS, and NCDC] overlaying a wavy, red shaded band of previous MetOffice model projections and a green band representing the CMIP5 ensemble of GCM model projections. Meanwhile the spaghetti ensemble of new model projections from the MetOffice’s Hadley Center for Climate Prediction and Research tacked onto the end [the nub of their argument] kind of blurs into a blue wedge with a very steep slope – my chief complaint. In my opinion, visually, this graph as a whole ‘reads’ as a trend that starts [conveniently] at a low in the early 1960’s at about -0.5°C, rises steadily until 2000 where it levels off for about fourteen years at about +.2°C, then suddenly takes off again in 2014 until it peaks at a high of +0.65°C. This is simply not going to happen, an additional +.4°C of warming globally in the next four years?? Really?? If this is really the spread on the Hadley Center’s models then they have a real problem. Even the IPCC in it latest 5th Assessment Report has ratcheted back its prediction of global warming to around +0.13°C per decade; +0.4°C in four years is not a measure of reality on planet Earth, this is somebody’s paranoid delusion. I think that somebody really wants it to by your paranoid delusion too. Maybe its just me being: negative, pessimistic, and paranoid again, but as far as I can tell the only real function in this figure being published by the METoffice is to – ONE MORE TIME – put an image in front of the public that ‘shows’ the earth’s surface temperature headed through the roof – pure eyewash. 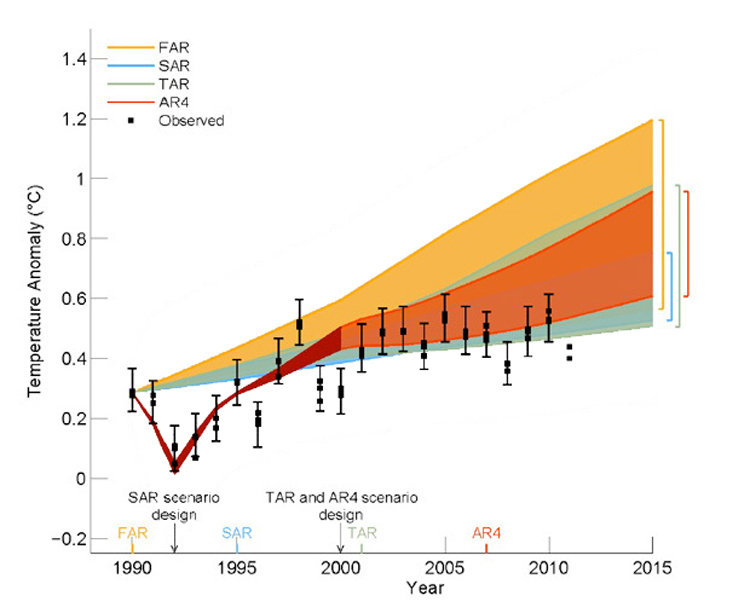 It is becoming common knowledge that the trend in the change of global average surface temperate has not changed in fifteen or more years [depending on whose numbers you use] a statistically significant period of time, so it becomes more and more difficult to place new images in official publications that depict projections of rapidly rising global temperatures. Paranoid people are becoming creative with their graphics even as it gets harder to bodge the numbers. For the last year or so I’ve been suspicious that graphical figures in some publications have begun to show signs of being artfully crafted to communicate a visual narrative that the underlying data cannot tell – VISUAL LIES in other words. 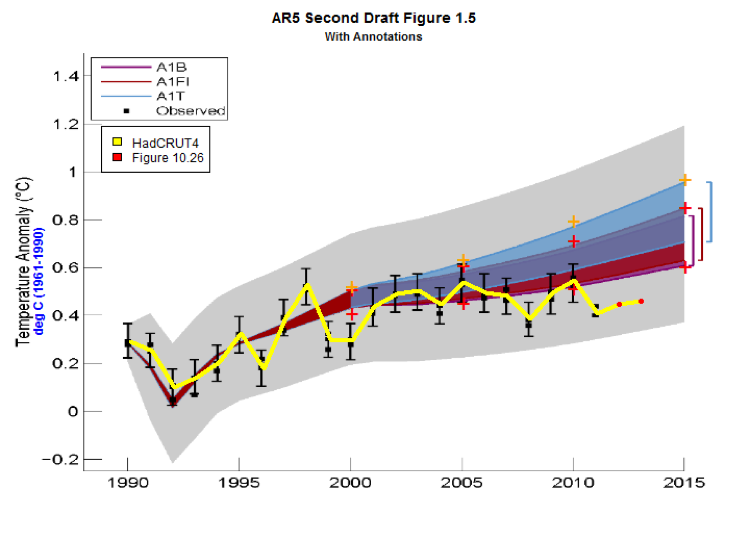 Maybe I AM just being paranoid, but in the instance the now famous [now deleted] AR5 Second Draft Figure 1.5 discussed over at Climate Audit back on Oct 8th we have a figure that contains a curious grey graphic artifact masquerading as an uncertainty envelope that was never part of any of the relevant data sets. Somebody introduced that graphic element into the chart manually and intentionally. We don’t know who that person is or what their motivations were, we don’t have the emails – yet – but that grey swoosh has one graphic function, which is to keep the appearance that the yellow line representing HadCRUT4 instrumental observations of surface temperature were inside the bounds of SOMETHING, rather than having departed from the land of general-circulation-model-a-mania back in 2006 or 2007. 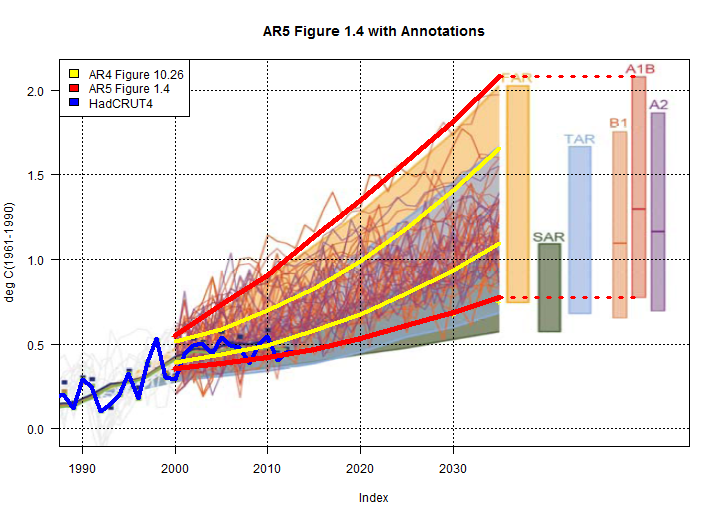 Actually its the other way around, the IPCC’s ensemble of climate models have all departed from the reality of the observed temperatures on planet three – observations rule in science, models must conform to reality, not vice versa. So, in my mind, there seems credible reason to be suspicions here with this new piece of work by the METoffice. Seems to me like we have something similar at work here, a graphic that commences at the bottom of the last trend and ends at the top – this seems to be SOP in climate science, thus beyond criticism [sarcasm here]; however, the introduction of a ‘spaghetti graph’ as graphical sub-element of a larger plot does seem to be a new trend. Does anyone else ever do this in ‘real’ life???. If I was TRYING to be obscure or graphically dissembling, this is probably exactly what I would do, and as was done with the AR5 Figure 1.4 [which you can also see over at the CA link]. Another example of the grey swoosh. The same graphic with the “grey swoosh” redacted. Another kind of spaghetti graph. ‘Spaghetti graphs’ are by nature difficult to ‘read’ visually, which is why ‘numbers’ people spend so much time trying to devise better ways of communicating data than spaghetti graphs. In audio engineering, for instance, the analogue wave-form is so complex you spend 95% or more of your time ‘looking’ at the ‘sound envelope’ that brackets the top and bottom actual wave-form. The ‘sound envelop’ being the imaginary lines that the pattern recognition software biological evolution has installed in the engineer’s brain automatically draws across the peak and below the troughs of the wave form displayed in his editing software and that shows the general ‘shape’ of the music or dialogue. Some editing software actually draws this in for you on-screen, but it really isn’t necessary, if you’ve been looking at this stuff for a while your brain puts it in automatically – which is my point. 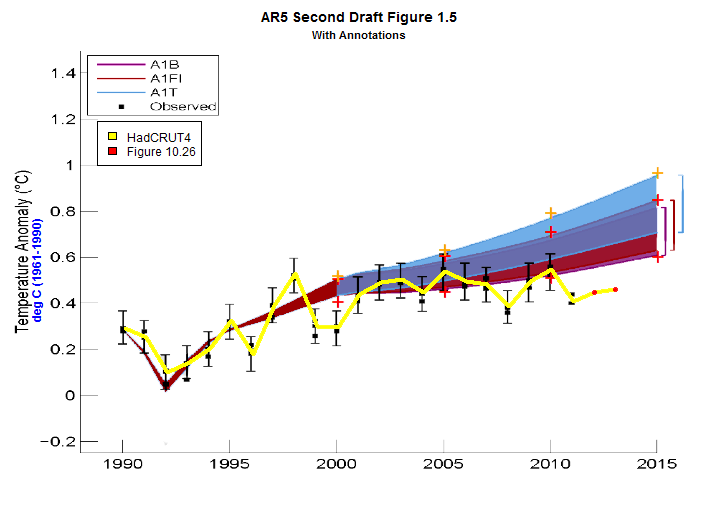 Fig 1 – Here it is again, culprit du jour [©METoffice 2014] The official caption: Figure 3: Observed (black, from Hadley Centre, GISS and NCDC) and predicted (blue) global average annual surface temperature difference relative to 1981-2010. 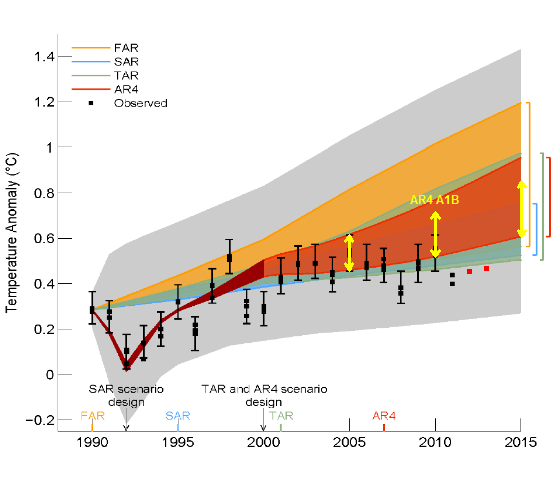 Previous predictions starting from November 1960, 1965,… 2005 are shown in red, and 22 Coupled Model Intercomparison Project phase 5 (CMIP5) model simulations that have not been initialised with observations are shown in green. In all cases, the shading represents the probable range, such that the observations are expected to lie within the shading 90% of the time. The most recent forecast (blue) starts from November 2013. All data are rolling annual mean values. The gap between the black curves and blue shading arises because the last observed value represents the period November 2012 to October 2013 whereas the first forecast period is November 2013 to October 2014. Again, I do not know who produced the MetOffice graphic or what their real motivations were – we don’t yet have their emails – but the introduction of that bit of ‘spaghetti’ at the tag end of the graph does have one spectacular graphical effect, which is to create a dark contrasting edge against a neutral background that creates the visual impression of a line, starting NOW, that heads straight to thermageddon in four years at a slope two to three times that of any four year period in the graph. Do I think this graphic was the product of a deliberate conspiracy to dupe the public? No, almost certainly not [though possible], I don’t think anyone at the METoffice has the intelligence or the talent to pull off a really good conspiracy [based upon my apprehension of their past attempts at conspiracy and having read some of their emails], I think they are basically just a bunch of hacks – in the old fashioned and pejorative sense of the word – hacks who are completely convinced of their own correctness with a consequent dumbing down of critical thinking and ethical standards. If you’ve ever been around when a group makes a decision like this, you’ll know this is about how it works and why I say it is that the IQ of the group mind is approximately the root mean square of the IQ’s of the group members – not that bright. I don’t think this was a conspiracy in the normal sense of the word, it was simply a group of like minded people projecting its own rather paranoid and apocalyptic inner narrative to the outside world – [almost] completely unconsciously. So here we have it yet another example of pattern recognition in physics – hard at work. This entry was posted in Climate, Philosphy of Science, Uncategorized and tagged Climate Audit, collective narrative, Global Warming, group mind, METoffice, Propaganda, Steve McIntyre, Tallbloke by w.w.wygart. Bookmark the permalink. I am sure this is all a bad dream and that I’ll wake up some day to find that the Met office has evaporated. Meantime, is it not time ripe for another bit of whistle blowing explaining how this nonsense was contrived? Yeah, the Gray Swoosh. And, yeah, it is a “conspiracy” when two people know that the general observer will be mislead into thinking the gray swoosh is some sort of certainty bar, and that observations (therefore) are just at the bottom (right now!) of prior predictions. The doers and the agreers knew what they were doing. They did “conspire” to mislead. Shame on them. TB you flatter me. If anyone were to be given credit for going into detail on the IPCC model forecast, doing the exhaustive research and analysis, that would be Steve McIntyre. The pattern-fitting portion of my monkey brain merely went, ‘I’ve seen this before’ then went back to Climate Audit to flesh out the details. The peculiar irony in all of this is that because I use the words “conspiracy” and “big lie” in a single sentence I have been reblogged by one of these weird conspiracy mill websites along with the Chemtrail and the false-flag 911 people. My presumption is that this graphic was the product of what I call a “conspiracy of the like minded,” what you get in an organization that has successfully purged itself, or has self-selected out, any really dissenting opinion – this is actually very common.